Check out Part 1 of this series if you haven’t already. This is a continuation of that article. In part 1 of this tutorial, we set up a nice little framework to help us build up our maps. 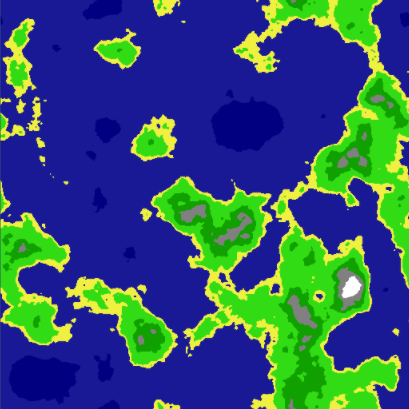 The Height Map we created previously, was not tileable. This is because we sampled 2D noise data, which is not capable of providing us with what we need. If we want to make our world wrap around seamlessly, then we are going to need to add some dimension to our noise generator. With 3D noise, we can sample data in a circular pattern, and the resulting 2D data will wrap on a single axis. The sampled data would resemble a cylinder in 3D space. Imagine if we took this cylinder, cut it open, and laid it flat. This is essentially what we will be doing. The ends where we made the cut, would be able to join together seamlessly. In order to do this, we need to modify the GetData function in our Generator class. In order to get our map to wrap around both axis, we need to start sampling 4D noise. This concept is a little more difficult to grasp, as our minds have a hard time thinking in 4 dimensions, but is very similar to the 3D example. 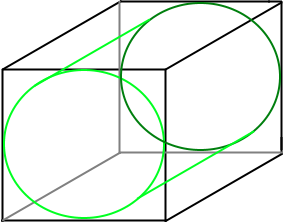 Instead of having a single cylinder, you would have two cylinders connected together, in a 4D space. Keep in mind, that sampling 4D data takes a lot longer than sampling 2D data. If you would like more information on how this works, have a look here and here. Now that we have a tileable Height Map, we are starting to get a lot closer to our goal. Now, we are going to shift focus towards the Tile class. It would be very useful if each Tile object had a reference to each of its neighbors (top, bottom, left, right). This comes in handy for things, such as creating paths, bitmasking, or flood filling. We will touch on these aspects later on in this tutorial. MathHelper.Mod() will wrap the x and y values for us, based on our Map width and height. This will ensure we never go off of our map. Visually, this doesn’t do much, yet. However, each Tile now knows who their neighbors are, which is very important for future steps. Based on a tile’s neighbors, we increment the bitmask as shown on the left side of the above image. All possibilities are illustrated on the right side. Note that each value is unique. 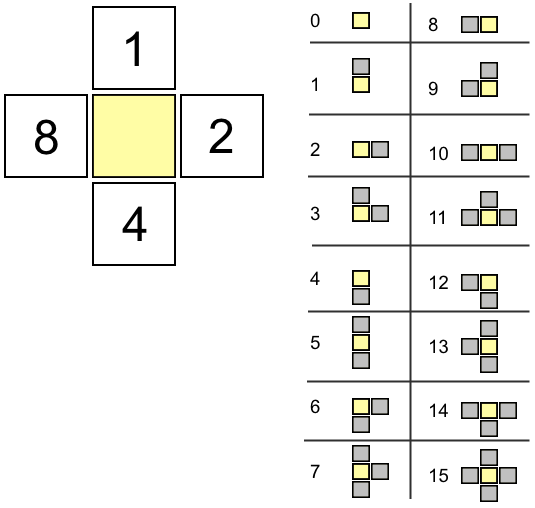 This allows us to identify a block’s configuration very quickly. The main benefit of bitmasking, is that you can then assign a texture, based on the bitmask value of each tile, making your maps a lot prettier and way less blocky when done properly. Another benefit of bitmasking, is that if a Tile’s bitmask value is not equal to 15, then we know it is an edge tile. Let’s add a function in our Tile class to do the calculation. We are only concerned with neighbors that share the same Height Type as the tile being analyzed. Where are the Land Masses? How big are each of these? We can answer all of these question, with the help of a simple Flood Fill algorithm. The TileGroup class will hold a reference to a list of Tiles. It will also let us know if this particular group is Water or Land. The main idea is to break down connected pieces of land and water into TileGroup collections. Collidable will be set inside of the LoadTiles() method. Anything that is not a water tile, will have Collidable set to true. The FloodFilled variable will be used to keep track of which tiles have already been processed by the flood filling algorithm. Now we are ready to determine land and water masses in our map. I generated a couple of textures to demonstrate how useful this data can be. The left side image, all land tiles are all black. 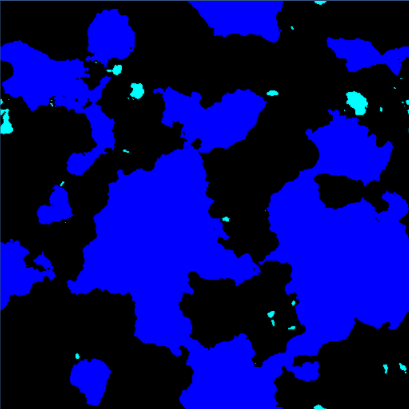 The ocean tiles are blue, and the lake tiles are cyan. The right side image, all water tiles are blue. 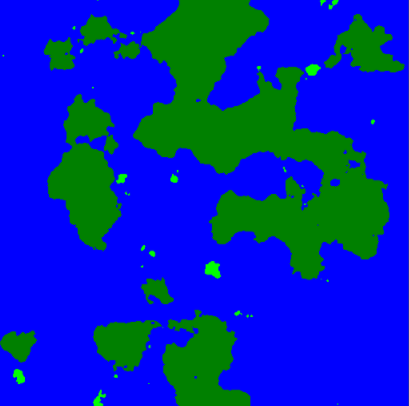 Large land masses are dark green, and islands in light green. As you can see, we now have a lot more information on our generated map, and it effectively answers all of the questions we set out to answer. Source code for Part 2 can be found here on github. Continue to Part 3 of this series. Great tut, how did you generate the flood filled textures? The same way as all the other textures. If you need more details on something specific, feel free to email me. Yeah, I just cant see how you use the FloodFill functions in that script. The FloodFill() function is called when loaded. That function does a complete floodfill on the entire map. 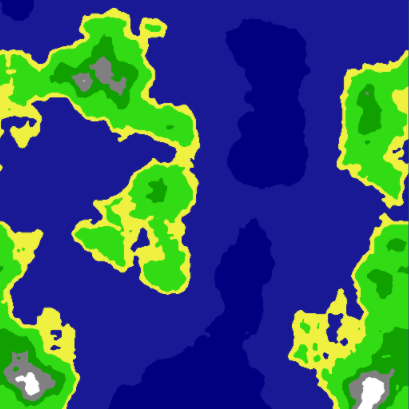 While doing this, it creates two tile groups — one for water tiles and one for land based tiles. These collections of tiles then represent the data we need to generate those flood filled textures. The TextureGenerator is used with this data to spit out the final images. A little interested on where I can find this MathHelper. I checked out http://forum.unity3d.com/threads/released-math-helper.164801/ but unfortunately this has been removed from the Unity Store. Preferably I wouldn’t want to spend money to complete a tutorial but you did such a great job I just wanted to thank you and ask where I could find that package at. Really good, thank you very much. Could you please explain me this part of the code? Is that “Get” thing something of yours? HeightMap.Get is part of the ImplicitFractal.cs class. This is from the AccidentalNoise library. On this line of code, we are sampling the data at coordinate (nx, ny, nz). This is not my code, as explained in the article. It is part of the Accidental Noise library. call I almost never get any values greater than 0 with the 4D cylinders. Is that normal? 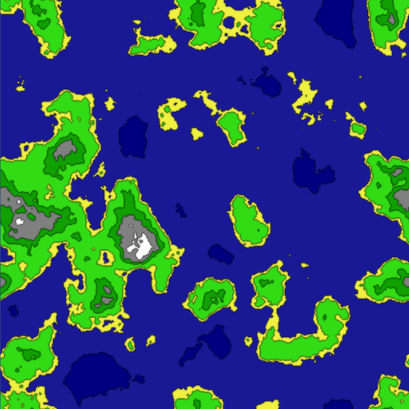 I understand how you identified the Water and Land TileGroup based on Collidable, but how did you isolate the Lakes and the Small Islands as shown in the last two textures? I presume it must have something to do with Size, but I can’t quite figure out how you used FloodFill to achieve that. The floodfill creates groups of tiles. I simply used the Count of each group to determine it’s size. Then you can compare, or set an arbitrary size value as the cutoff to determine what is a lake or an ocean. The tiletype determines if it is land or water. Can’t figure out why it don’t work but tried a lot and can’t have my map wrapping on Both Axis.